Daisy Lodge01263 761705work01263 761705fax Self-cateringThis is a detached, converted petite barn sympathetically restored. Set in a quiet relaxing village, just 2 miles from Holt. All accommodation is on ground level with a bunk bedroom and a double (king size) bedroom. A delightful opportunity. This is a detached, converted petite barn sympathetically restored. 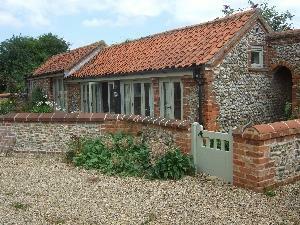 Set in a quiet relaxing village, just 2 miles from Holt. All accommodation is on ground level with a bunk bedroom and a double (king size) bedroom. A delightful opportunity. Nb. Due to the design of the barn, the bedrooms have to be walked through to get to the bathroom. From the A148 at Holt, take the Thornage Road. Proceed into Thornage and take the Letheringsett Road. Daisy Lodge is approximately 200 yards on the right hand side.